Scheduled to partially open in 2018, The Grand Egyptian Museum will be the biggest museum in the Arab world. Currently built near the pyramids of Giza with an exhibition space of about 40,000 square meters, the building complex is intended to accommodate up to 15,000 visitors a day. Top companies from around the world were commissioned for the various design components of the project (architecture, exhibition design, graphics). Tarek Atrissi Design was commissioned to develop the core branding concept of the new museum in collaboration with Atelier Brückner. The goal for the project was to design the basis of the full branding solution for the museum, setting up a detailed and broad visual language that the museum can follow internally to build and operate a recognisable visual identity. The design of the logo was inspired by the unique shape of the museum building, as seen above. The top view of the architecture – considered as the 5th façade of the museum – was replicated in a graphic form that included a custom made contemporary Arabic calligraphy with the name of the museum. 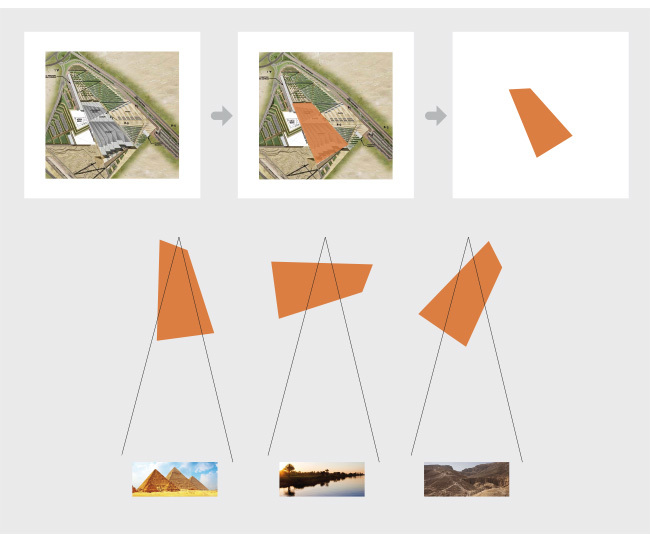 The positioning of the logo shape is dynamic and constantly changes when it is used, reflecting how the museum has been designed to create connections to the rich landscape around it- including the pyramids, the city of Cairo and the Nile. The Logo design reflects the different historic perspectives seen from within the museum building, and symbolised the connections made between the interior vs the exterior space of the building’s unique location and design. The dynamic graphic shape of the logo becomes the main element in the graphic language created for the museum, extending beyond it to create perspectives that crops visuals or photographs from the rich collection of the museum showcasing the history of the pharaonic Egypt. 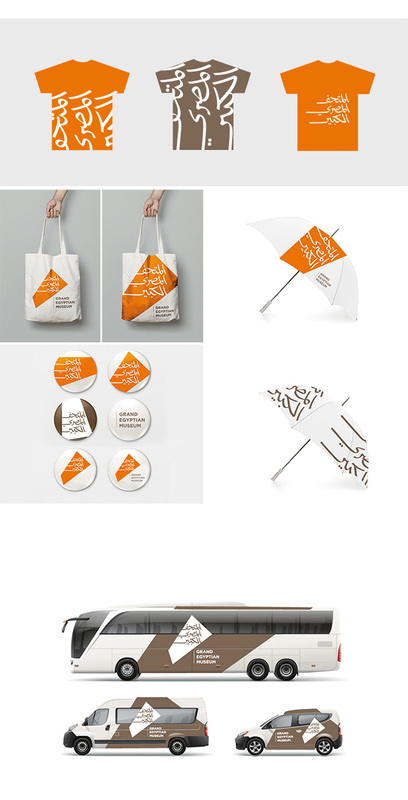 The branding concept and branding assets, as showcased in this page, were delivered to the internal design team of the Grand Egyptian Museum to be used and managed further internally within the communication needs of the Museum.